This is the fourth year that we have been working in Woomera Reserve in Little Bay for our client Randwick City Council, and the site looks significantly different. Woomera Reserve (pictured left) is a creekline that follows the natural existing water course. 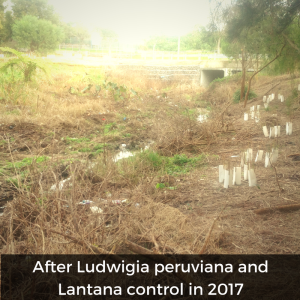 The site runs parallel to Bunnerong road in Little Bay and contains mostly indigenous planted vegetation, but there is a small section of remnant Coastal Dune Forest as well as some remnant riparian species (Typha orientalis and Persicaria decipiens, Ludwigia montevidensis ssp. peploides). The site has cultural significance with a shell midden unearthed on the bank of the creekline. Yellow-tailed black cockatoos, white ibis, white faced herons and currawongs frequent the site and it is home to a diverse range of invertebrates and reptiles, including eastern water dragons, blue-tongue skinks and more recently a yellow-faced whip snake! 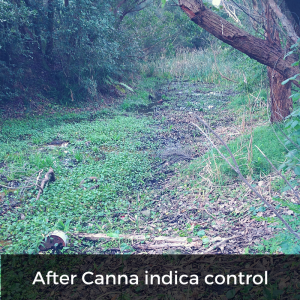 Works within the creekline have focused on controlling numerous infestations, including Ludwigia peruviana, Ipomoea indica, Ageratina adenophora, Canna indica, Lonicera japonica and Paspalum urvillei. All primary and secondary works have been completed and works are now at a maintenance stage with regular sweeps undertaken to prevent any recurring specimens from establishing. Works on the banks of the creekline have focused on preventing exotic annuals from seeding and reducing exotic grass infestations. Works are also now at the maintenance stage. 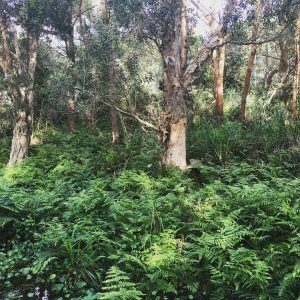 Some of the bushland zones have been expanded and revegetated with species typical of Coastal Dune Forest and Coastal heath. 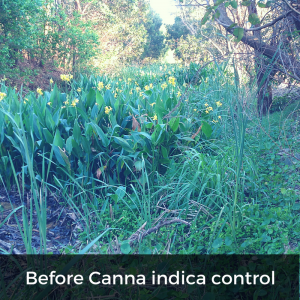 These plants are establishing well and welcomed the rain last week! 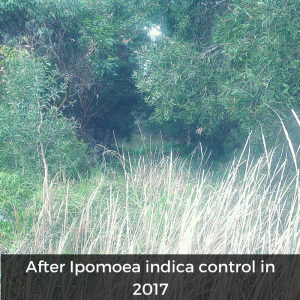 Successful native regeneration has occurred in areas where weed infestations have been treated with the establishment of the primitive fork fern, Psilotum nudum, and a happy amount of Hypolepis muelleri (in the picture above), as well as Glycine microphylla and Billardiera scandens. 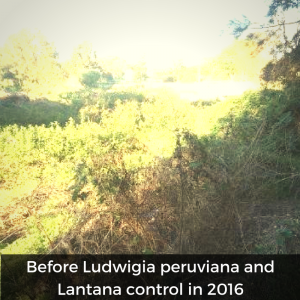 In 2016, Randwick City Council provided us with additional funding to expand works to tackle Lantana camara, Ludwigia peruviana, Ipomoea indica and Anredera cordifolia north of the original works site (before and after photos can be viewed below). 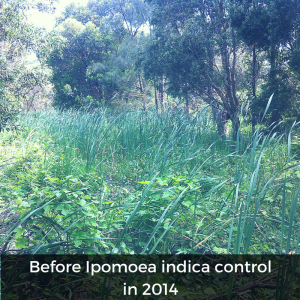 These works have also progressed to the maintenance stage with Ipomoea indica almost completely eradicated from this section. Woomera Reserve is an important habitat stepping stone between Phillip Bay and Botany Bay National Park and we regularly remove litter from the site, preventing it from washing into the ocean.